Is it articulated, or is it exalted meanings that derive existence from the Existence of the Exalted Self? The first group said that speech is attributed to Allah; they derive existence from the Existence of the Exalted Self; He, Glory be to Him, speaks whenever it pleases Him, with His Power. Allah, Glory be to Him, called Moses and called Adam with a voice, but the words and the voice He uttered are an attribute of His Exalted Self, unparalleled and can not be compared to the words and the voices of creatures; He,Glory be to Him, related in the Qur’an about Jesus, “..and to MosesGod spoke direct” (NISAA’, 164). Other Quranicverses denote that Allah, Praise and Glory be to Him, really calledMoses from behind a veil and not through angels; “And We called himfrom the right side of Mount Sinai” (MARYAM, 52), and Speech is hence incidental because He said, “When Moses came to the place appointed by Us, and his Lord addressed him” (A‘RAF, 143). So, the Call is proved here; it must be an audible voice. Moreover, Allah spoke to Adam and Eve and this took place after the sin had been committed. The holy books are the Speech of Allah; He spoke their words with all their meanings and expressions through His Own voice. Allah spoke in the Torah in the Hebrew language and in the Qur’an in the comprehensive Arabic tongue; when people recite it they read it in their own language and since it is Allah’s Speech, it is His Book because it had been written in the Preserved Tablet and in the copies of the Qur’an. The second group said that Allah, Glory be to Him, speaks, commands, forbids, warns, promises, and threatens by His Speech; the eternal, ancient, unparalleled Speech that can not be compared tothat of His creatures. It is neither uttered through a voice that is produced by the vibration of air or the friction of objects nor by the movementof the lips and the tongue. Although the Qur’an is recited by tongues,written in books, and memorized by hearts, it is ancient and eternal derivingits existence from the Existence of Allah, and it will never beseparated, fragmented, nor altered through conveyance to the hearts andpapers. 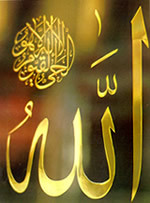 They also said that Moses heard Allah’s Speech without a voice, just as the righteous see the Exalted Self of Allah without an essence in the hereafter; Allah’s Speech is the words of the soul but voices are fragmented into letters which serve as indicators andsignals; gestures are used for the same purpose. Furthermore, if we can understand that Allah has an all-knowing Power, then we can perceive that He has the power to speak with everything that denotes expressions. The Speech of Allah derives its existence from His Existence, is ancient, and so are all His attributes, as itis impossible to think that Allah is subject to events or change. Thereupon, Allah’s Speech is ancient and the Speech is self-existent; what is recent are the voices that denote it; for instance, when Allah said to Moses, “Therefore, in My presence put off thy shoes” (TA-HA, 12), this is a request that had been formulated by Allah since eternity and Moses was addressed after he had been created. The Speech of Allah is not unknown; the manner is unintelligible; believing in it is a must; and any attempt at knowing the manner or the modality is a rebellion against the teachings of our ancestors. To the first group we say: If this viewpoint is true, how then was Gabriel revealing to the Prophet, Allah’s Prayers and Peace be upon him, the Qur’an? Sometimes, he came to him inthe form of a human being and sometimes the revelation came in the formof the clank of a bell, and this was the most severe, then he would graspwhat he was told. How come then this revelation had been revealed througha voice while the Companions had been sitting and heard nothing? Moreover,the Prophet, Allah’s Prayers and Peace be upon him,differentiated between the Speech of Gabriel when he came to him in theform of a human being and the revelation when it came to him in the formof the clank of a bell. Furthermore, Allah said, “So We sent this inspiration to the mother of Moses” (QASAS, 7); wasthis Speech to the mother of Moses through a voice or was it a mere inspiration as the kind of innate inspiration mentioned in the verse, “And thy Lord taught the bee to build its cells in hills, on trees, and in men’s habitations” (NAHL, 68). A letter is uttered when the two lips are brought together andthe tongue moves so that the voice is broken into letters. Sounds arisefrom friction of celestial bodies that produces sound waves and thisneeds an atmosphere of air because a sound in a vacuum does not exist.That the sound needs a medium to transform it and that the articulated lettersneed lips to articulate them can not be applied to Allah, Praiseand Glory be to Him. To the second group we say: The fact that Allah created Moses and endowed him with perceptions and audition to enable him to comprehend His Speech that derives its existence from the Existence of His Exalted Self is something, and the direct Speech is something else. Allah, Praise and Glory be to Him, said, “..and to Moses God spoke direct” (NISAA’, 164). Therefore, we must believe that Allah speaks, then we have to entrust the knowledge of the manner and the modality of that speech to Allah, Who is unequaled. Praise and Glory be to Him, He is Allah.